Last Minute Project for Mom! Individual cavity molds. 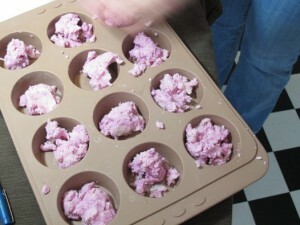 I really liked using a silicone muffin pan. Shred 28 oz of soap. I happened to have an uncolored/unscented soap perfect for this hand-milled project. See if you have any soap where the fragrance has faded away…those would be perfect also. To shred the soap you can use a cheese shredder…or my favorite tool…a Salad Shooter! 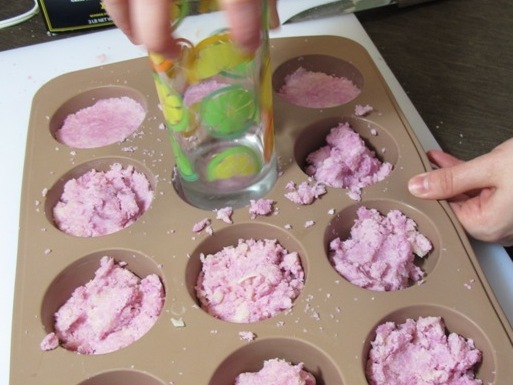 I don’t think I would do rebatch or hand-milled soap without a Salad Shooter. 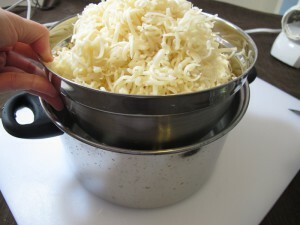 I like to heat my shreds in a double boiler type of setup. 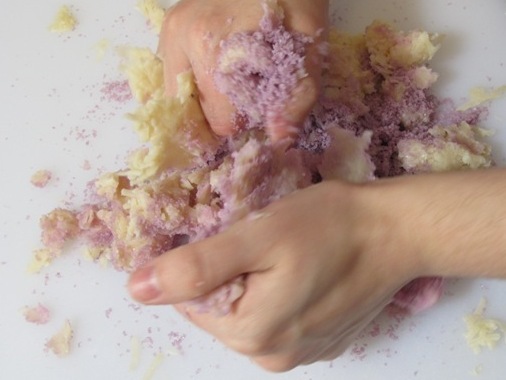 Check out Anne-Marie’s tutorial on rebatch. While that is heating up, let’s prepare our additives. We’re going to do layerd bars. In one container measure out 1 cup of salt, 2 ml Fuchsia LabColor, .5 ml Canary LabColor and .5 oz Baby Rose fragrance oil. In another container measure out 1 cup salt, 1 tablespoon Walnut Shells and .5 Lilac fragrance oil. Mix them both up! 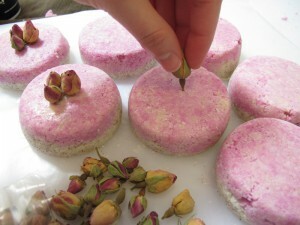 I love using floral fragrances with hand-milled or rebatch soap. You don’t run the risk of acceleration like you do when making CP. The soap shreds are ready when they are translucent in color. Since these shreds are about 4 weeks old I did sprinkle them with a bit of water to add some moisture. Now for the fun part! Do you have kids? This would be fun for them to help with. 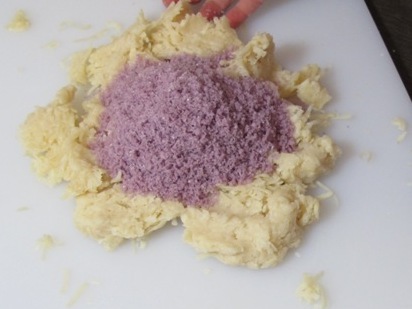 Dump the soap shreds onto a cutting board and mix and squish like play-dough! 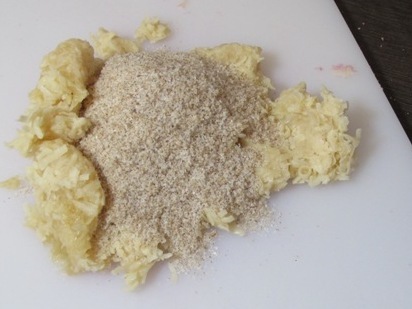 Divide the mixture in half and set one half to the side. Just eye ball it! 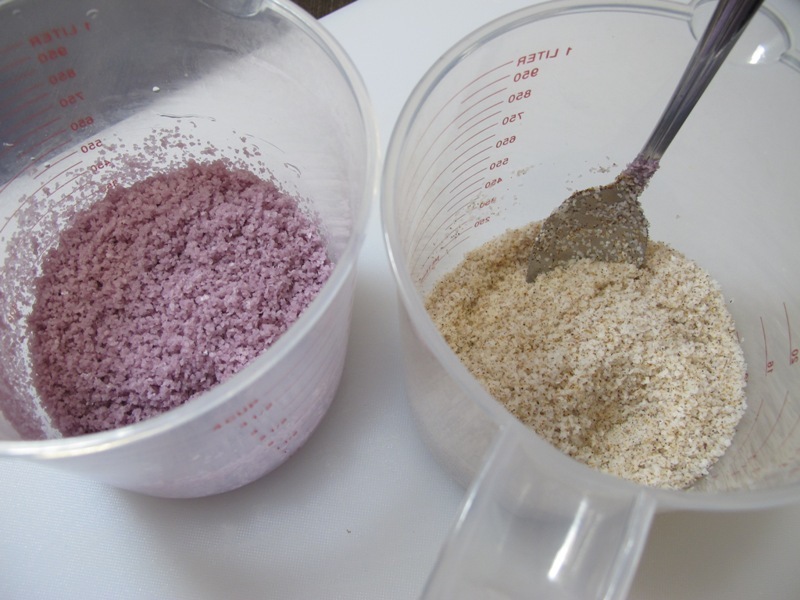 Dump the pink/rose scented salt onto one divided half and mix…mix…mix until all of the salt is incorporated. Once you have it all mixed, divide it up into your molds. Just eye ball it. Use a cup to press this layer down. Do the exact same thing for the next layer. 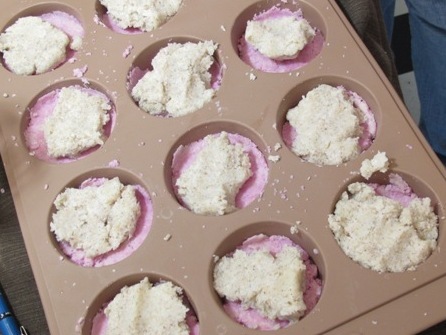 You might have to heat up the soap shreds a bit if they cooled down. I had mine in a glass container and microwaved for two rounds of 15 seconds. Careful not to overheat! Dump it onto your cutting board and mix in the lilac scented, walnut shell, salt mixture. Once you get it nice and mixed…divide it up into your mold. Once again use a cup to press everything down. Press hard! I put these in the freezer for about 30 minutes and they were ready to unmold. I had some Pink Moroccan Rosebuds that I thought would look perfect on top. So I stuck about 3 into the middle of each soap. These were already rock hard after a couple of hours but give them a couple of days to really harden. Whew! Now I have the perfect Mother’s Day soap to give out on Sunday. Previous Post: Soap Swap and a Baby? I like the question about the salt. Is this a fine grain salt..like table salt consistency or is it the bigger salt? I don’t have any dead sea salt or anything, but I can get some regular sea salt from the grocery store, will that work? Love this recipe, thanks for sharing! My bars came out not very “scratchy”…it was more of a very, very gentle exfoliation…could it be because my salt wasn’t fine enough?? Can’t wait to make more! Would there be a way to make these with melt and pour base? The salt reacts a little differently with melt and pour. So I would eliminate the salt from the recipe and just go with the walnut shells (and you could add an additional exfoliant too if you wanted). But you can use the same colorants and fragrance oil. It will have a totally different look to it but it can be done. Great idea! Shall give it a try. Doreen – go to amazon and do a search for salad shooter. I got one for 33 bucks! 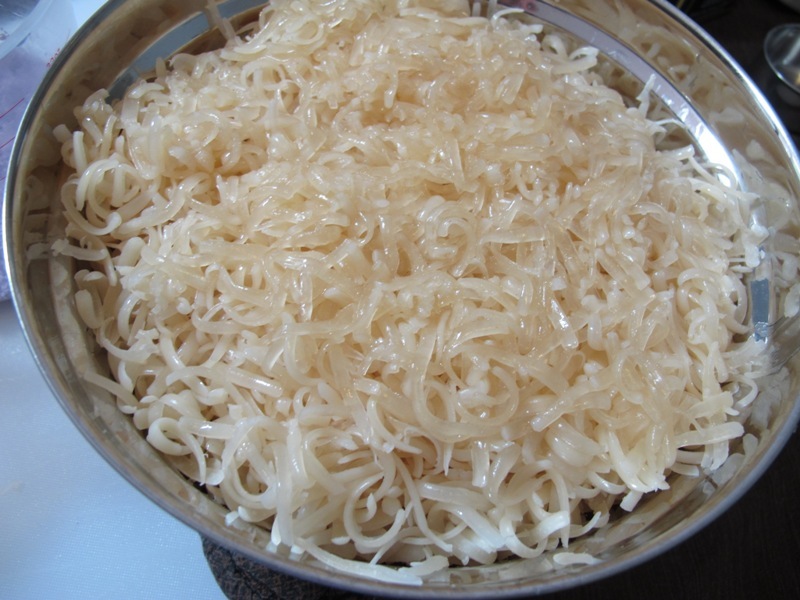 If you do rebatch…it’s a must! Debbie – You should be able to used seized soap. I would give it a try. Yes, skip the FO and colorant. These look lovely. I have soap that seized so I quickly made balls with it. It already has FO (Rosehi Jasmine) & Fushisa labcolor. Could it be used for this recipe? Would I just skip adding the FO & colorant? ok…what is a salad shooter??? just love it. never made soap with salt, will have to try it. Sophistecated, delicate and with a beatifull fragance. I have to try to do it!! Regards to Anne and her super cute Jamisen!! He looks very peaceful surrounded by soaps. Amanda did do a great job. I love the rustic, handmade look to them and I agree…sophisticated too! Well done, they look beautiful. the colour is so pretty and just perfect for Mothers Day. 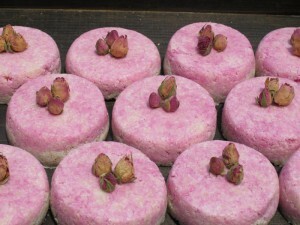 It’s amazing to think you can make a soap in a hurry without the 4 week wait, another great job, thank you! Thanks, Jan! I love using Lab Colors! They really give you a wonderful range of colors. Those are so pretty and I’ll bet they smell so good! I do tend to “eye ball it” alot! I always have to make myself write out measurements and stuff so I can tell other people how to do something! I just LOVE this soap!! I am going to BB and get what I need and make some..thank you so very much for sharing this wonderful idea! wow! 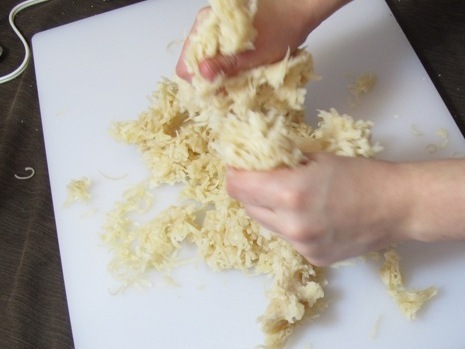 Those are great- and nice and scrubby too – do you think a similar thing would work with a M&P? I’ve never done an exfoliating bar like that before! 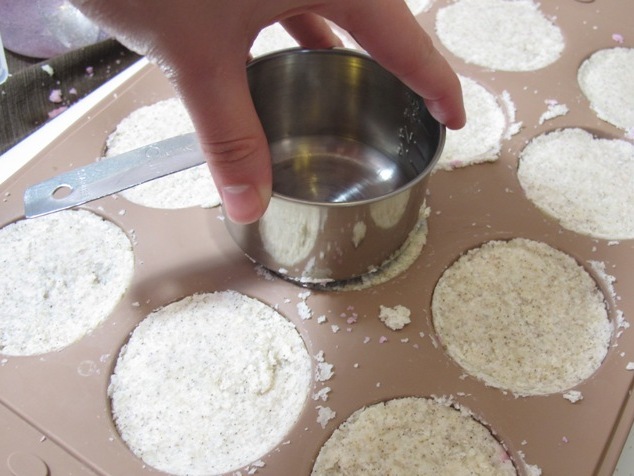 You wouldn’t be able to knead the salt in like this project did. But I think Soapylove’s latest Ezine has info about using salt in MP. Someone should offer you your own TV show. You would be great at it. What a cool project. The end result is so pretty too. Thanks, Claudia! They were fun to make!